Gateway AntiVirus is a fully integrated, signature-based security subscription that blocks spyware, viruses, trojans, and blended threats in real time. It scans all major protocols at the gateway to stop threats before they can gain access to your trusted resources and execute their dangerous payloads. Suspect email caught by the Gateway AV engine can be flagged to go into quarantine, and all actions are logged and available for easy reporting. With its optimised signature set, heuristic analysis, and broad file-handling capabilities, Gateway AntiVirus adds up to exceptionally effective, wide-ranging AV protection for your business network. Have the flexibility to define the action to be taken when malware is identified - enabling the network to allow, block, quarantine, or lock questionable traffic based on type, user/group, and protocol. Dynamic heuristic analysis uses code emulation to identify polymorphic viruses and dangerous code that signatures don't catch. Compressed and encoded files are decompressed for inspection, with comprehensive compression format support. Suspect email can be flagged to go into quarantine, where administrator can restrict access or allow users to review quarantined files through automatic email alerts. Buffered scanning process ensures optimum performance for in-line HTTP scanning. WatchGuard Gateway AntiVirus provides network-wide protection for all users. It works in tandem with the application layer content inspection of Firebox appliances to protect against known malware. WatchGuard Gateway AnitVirus scans traffic on all major protocols, including HTTP, HTTPS, FTP, CTP, UDP, SMTP, and POP3. Email traffic is scanned at the gateway to stop threats before they gain access to your servers. Safer web browsing is enabled by preventing the download and execution of malicious code. Incorporating the award-winning Bitdefender scanning engine, WatchGuard Gateway AntiVirus uses both signature techniques, as well as dynamic heuristic analysis with code emulation, to catch polymorphic viruses and malicious code that signatures can’t catch. 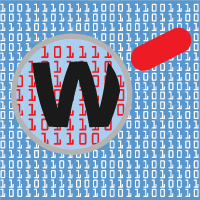 Compressed and encoded files are decompressed for thorough analysis with wide support for different compression types. Signatures are continuously updated, ensuring timely and proactive protection against emerging threats. 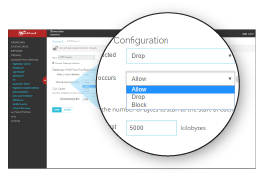 From an intuitive and flexible management console, you can choose which file types to scan and the action taken when malware is detected, including allow, drop, block, or quarantine emails based on type, user, and protocol. You also have the power to choose the action taken when a file cannot be scanned, including password-protected files. 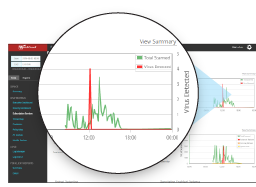 WatchGuard Gateway AntiVirus seamlessly integrates with WatchGuard Dimension for complete visibility into the top blocked malware (malware name, type, and number of hits) as well as the source and destination of the attack. You also have instant views with dashboards and charts that show the total number of files scanned and number of viruses detected over a set period of time. 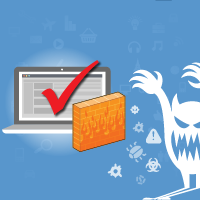 WatchGuard Gateway AntiVirus scans files and traffic flowing through the Firebox to identify known malware and riskware. If a threat is identified based on signature matching, the connection is blocked or the file is stripped.